For once, I’ll actually agree with a Federal Reserve governor; in this case, Richard Fisher, one of the “token hawks” kept around to play “bad cop” to the preponderance of “good” ones. In a statement that “Captain Obvious” himself would endorse, Fisher said QE is “distorting financial markets,” yielding “eye-popping levels of some stock market metrics.” You mean, like the most bullish sentiment EVER – amidst the worst U.S. macroeconomic environment and highest consumer prices, since the 2008 global financial crisis? Even “Whirlybird Janet,” in her capacity as Chief Economic Obfuscator, stated yesterday that the economy is operating “considerably short” of the Fed’s objectives; as reiterated this morning by New York Fed President Bill Dudley, who noted that “economic headwinds are likely to persist for a considerable amount of time” – and thus, “there’s still a long way to go before needing to raise short-term rates.” As in forever, given the economic implosion that every fiat currency Ponzi scheme in history has engendered. Just ask the managements of today’s earnings disasters – Costco and Staples or better yet, their customers. In other words, the Washington and Wall Street propagandists can lie all they want about “recovery”; but the fact remains that barely a third of Americans consider themselves better off than a year ago. That, my friends, is what occurs during recessions, not “recoveries.” In fact, the White House is so fearful of this reality, it last month launched the “MyRA” confiscation plan; last week, proposed a 2015 budget that would “only” produce a $564 billion deficit (which unfortunately, the Congressional Budget Office itself vehemently disputes); and this week, delayed the Obamacare mandate into 2016, knowing full well its catastrophic economic impact will all but destroy Democrats’ re-election prospects. In fact, I’m thoroughly looking forward to how the Obama Administration – er, the Bureau of Labor Statistics – presents tomorrow’s non-farm payrolls report. Essentially all economic data point to a third straight miserable report; not to mention, yesterday’s ADP shortfall, and the below, damning chart. And thus, we’ll have to see what its political agenda truly is – particularly as Janet Yellen’s first FOMC meeting is less than two weeks away. Trust me, there’s a reason the BLS’ “birth/death model” purposely deletes year-ago data – as you can see here; as its sole goal is perpetuating the myth of “recovery,” while simultaneously maintaining the QE necessary to prop up financial markets. Moreover, they have to figure out how to prevent the 1.3 million of people whose long-term unemployment benefits expired in December from being deleted from the Labor Force; plus, the 3.6 million others whose long-term benefits expire this year. If the BLS reports in accordance to its own accounting standards, the “unemployment rate” will plunge below 5% in short order, making an utter mockery of the Fed’s policies – given that food stamps enrollment, poverty and other negative economic statistics clearly don’t gibe with the government’s recovery propaganda. In fact, in our year-end predictions, widespread understanding of the Fed’s cluelessness about unemployment is expected to be a major 2014 theme. Speaking of Fed cluelessness, isn’t it amazing how former Fed Chairmen “find religion” when giving $250,000 speeches after they leave office? Yes, the man who proclaimed he was in complete control throughout his entire, catastrophic eight year term, has all of a sudden admitted he was – essentially – lying. Elsewhere, it appears “Draghi’s Reckoning Day” has been postponed for another month. Despite vehement calls from the IMF for the ECB to not only reduce rates from 0.25% to 0.00% (or lower) but initiate outright QE, Draghi left the ECB’s ultra-easy monetary policy unchanged, while continuing to cite economic risks “to the downside.” Clearly, he is holding back his last quarter point rate cut – and more draconian monetary measures, such as QE and/or negative deposit rates – due to continued stock market strength; which in our view, relates solely to heightened inflation expectations. In other words, the second equity markets lose their mojo, you can “bet the ranch” the ECB, Fed, BOJ and other Central banks will turn up the printing presses to unprecedented levels. As for PMs, they were again “capped and attacked” yesterday, in typical Cartel fashion. In yesterday’s “just like Cyprus?,” we discussed TPTB’s typical, relentless attempts to downplay major geopolitical events in the minds of safe-haven seeking investors. Thus far, a joint effort between Washington, Wall Street, and the MSM has produced the desired effect – in that PM prices are just marginally higher then when the crisis broke out last weekend, whilst equities and Treasuries haven’t lost a step. However, even the past two days’ “2:15 AM” and “cap of last resort” attacks (the latter, at 12:00 PM EST) haven’t succeeded in preventing gold from reaching its highest level of the year; which should at least modestly scare the Cartel, given that – if anything – the Crimean revolution is worsening, with the prospect of another “anything goes” weekend upcoming. Which brings me to today’s topic, “silver anniversary”; quite apropos, given Miles Franklin launched its 25th anniversary celebration this week. Once again, I’m drawing from my good friend Steve St. Angelo of the SRSRocco report; in my view, the best PM-focused mining analyst on the planet. Yesterday, he wrote of how U.S. Mint silver Eagle sales are “stealing the show” this year, whilst mining companies continue to hemorrhage money by selling well below their respective costs of production. These concepts are nothing new to Miles Franklin readers – and certainly not those of “Admiral Sprott,” who for some time has noted how silver to gold purchases – in absolute dollars – have far exceed the silver/gold price ratio; which thus, cannot be sustained at such depressed levels. However, something Steve wrote really drove the point home of a pending silver shortage, right under our noses. That is, regular email dialogues he has had with U.S. Mint representatives, who have recently spoken of weekly “rations” of saleable silver Eagles. As you can see below, 2014 has started at a blistering pace, with silver Eagle sales on pace to shatter last year’s record levels. And this, despite January sales of 4.8 million ounces being well below January 2013 record levels of 7.5 million ounces (which should tell you how brisk February and early March have been). Yet, when one views the January sales figure – of the aforementioned 4.8 million ounces – it’s quite apparent that the 1.2 million or so of weekly “rations” Steve speaks of came into play. In other words, sales would likely have been much higher if the product were not SOLD OUT. Fast forward to February’s sales figure of EXACTLY 3.75 million silver Eagles, and it appears quite apparent that for one week, product was sold out; while during the other three weeks, 1.25 million ounce allotments sold out as well. As for March, Steve was told that the first week’s sales “allotment” was just 1.1 million ounces – of which an incredible 903,000 sold in the first two days (figures below, as of March 4th). In other words, it appears that silver demand is not only “strong,” but much stronger than the already blistering sales figures connote. Never before has the U.S. Mint been forced to allocate silver Eagle sales on a weekly basis, during a “non-crisis” situation; and thus, the current, comically low prices – both absolutely, and in relation to gold – appear to be on their last legs. 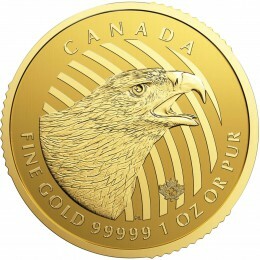 Last week, I wrote of how I personally sold some of my gold Maple Leaf coins – held at Miles Franklin’s Brink’s storage facility in Montreal – in lieu of new, limited edition silver Peregrine Falcons from the Royal Canadian Mint. 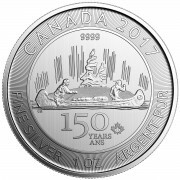 I doubt many Falcons remain to be purchased at today’s prices; i.e., roughly the same as generic silver Maple Leafs – and thus, encourage you to call Miles Franklin and inquire. But aside from the Falcons specifically, the aforementioned evidence of a potentially imminent silver shortage should be considered, as it has by myself. 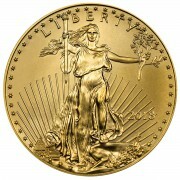 A year ago, my personal gold/silver ratio – in dollars – was roughly 63% gold/37% silver. However, due to the aforementioned factors, I spent 2013 – and early 2014 – reducing that ratio to 53% gold/47% silver, which I intend to maintain as long as the gold/silver ratio remains above the minimum, arbitrary threshold of 40:1 I am utilizing. Ultimately, I expect the gold/silver ratio to fall to at least its historical average of 15:1; and eventually, significantly lower once the world realizes that “poor man’s gold” is in far shorter supply. 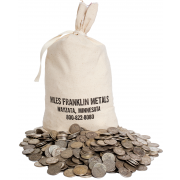 Yet again, on the theme of Miles Franklin’s 25th anniversary, I hope you’ll give us a chance to earn your business; as above all, you can count on our providing “honesty in a world of lies.” Just call us at 800-822-8080, and we’ll be happy to answer any and all questions about Precious Metals you could possibly have.